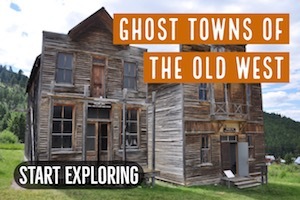 Near the Clearwater National Forest, lies the historic gold rush town of Pierce, Idaho. 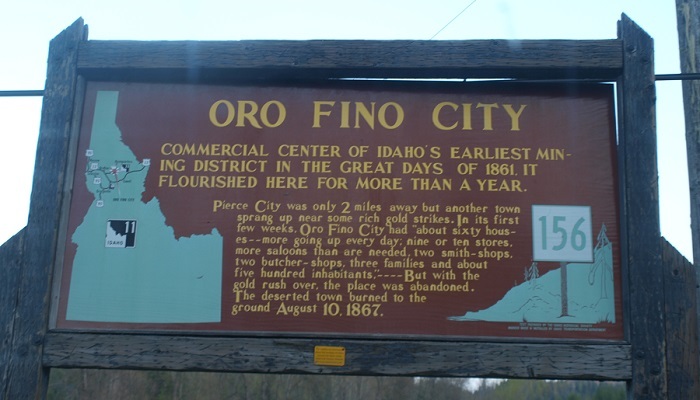 Located about 30 miles east of Orofino, the town of Pierce stands as the birthplace of gold mining in the State of Idaho. 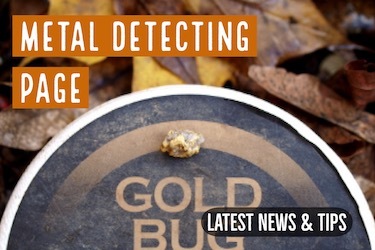 It has the notable distinction of being the first major gold discovery in the state. An evening look at downtown Pierce. 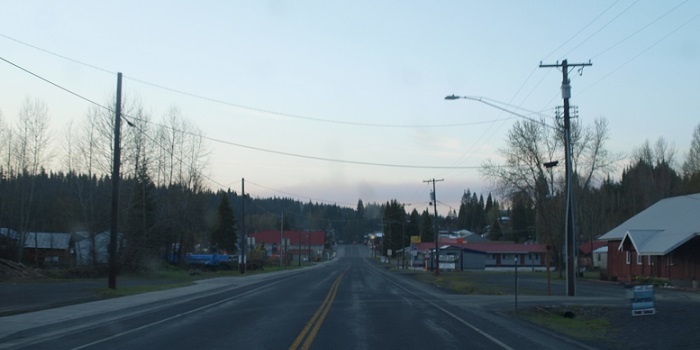 Pierce is located in Shoshone County, which was established on January 8, 1861 by the Washington Territorial Legislature, who named Pierce as the county seat. 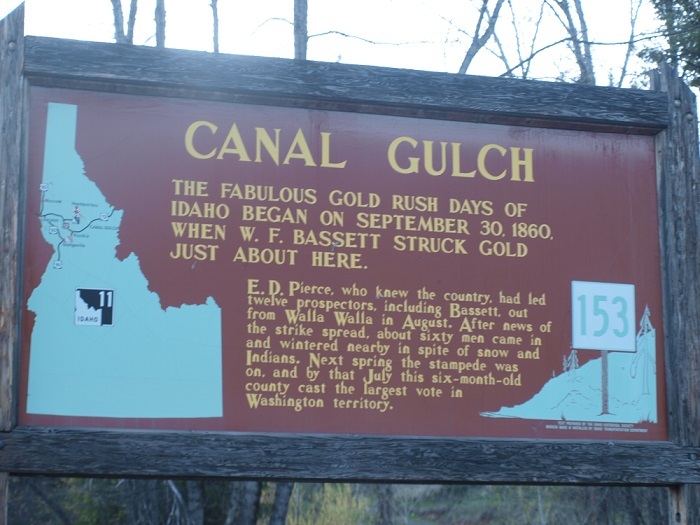 Gold was discovered by Elias D. Pierce and Wilbur F. Bassett on Orofino Creek, otherwise known as Canal Gulch, in October 1860. It was on this site that the town of Pierce was established. 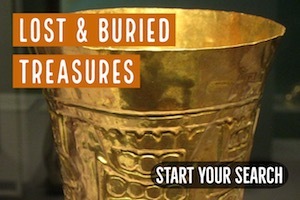 The discovery of gold in Pierce in 1860 is considered to be the most important historical event in the Clearwater area, and some even consider it to be the most significant historical event in Idaho in general. This discovery triggered the onslaught of settlers into the area. By the summer of 1861, thousands of settlers, seeking the fortune of gold, has come into the area. Overnight, Pierce grew into a prosperous and booming mining town. Roads, towns, farms and houses popped up all over the landscape. Idaho Territory was established in 1863 and the county seat later moved. Present-day Clearwater County formed in 1911, was a part of Shoshone County until 1904, when it was annexed by Nez Perce County. The majority of the miners came from California and they were already experienced prospectors who knew how to mine gold and who knew the best ways to prospect the streams. During the summers of 1861 and 1862, all streams had been prospected fairly well and all of the richest major gold deposits located in the Clearwater drainage were discovered. In 1863, approximately 800 Chinese miners rushed to the area to work the claims that had been abandoned by prospectors who had moved onto the gold discoveries in the Boise Basin..
Gold mining in Pierce could be viewed in three separate stages. Although the stages did overlap each other in some respects, each stage was well-known for a specific type of mining. 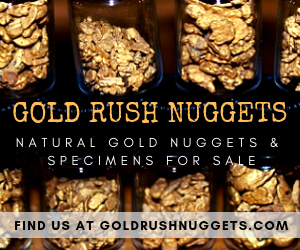 As was typical of most gold rushes in the West, placer mining was the first, which lasted from 1861 to 1892. 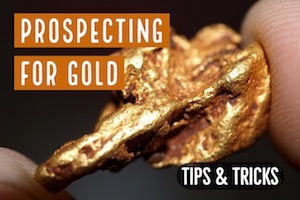 Placer mining describes the process of separating loose gold from the gravel and clay through washing. It embodies the picture many envision when thinking of the gold rush era, an old prospector wading in a river with a pan, sifting for gold. A lot of placer mining took place in Armstrong Gulch and the Rosebud drainage. Even today, you can still see parts of the old mining ditches. A fire burned through most of the Rosebud drainage and the head of French Creek during this time while clearing ground for mining in the area. The upper basin of French Creek was later mined by a group of Frenchmen who worked this area over a second time to prosperity. One of the richest placer areas in Pierce was Rhodes Creek. Both Preacher and Clearwater Gulches were part of Rhodes Creek on the National Forest. Gold was also discovered around Moose Creek and Independence Creek in July 4, 1862, but by the 1930’s the area was fully dredged. Placer mining did not last forever, and it was soon replaced by another process which brought in the second stage of mining. This second stage involved finding the lode claims and mining the ore specifically. This method required use of what is called a stamp mill to grind the ore and separate out the gold. This stage lasted primarily from 1892 to 1910. This type of mining was not particularly successful. First, the stamp mills tended to be extremely heavy and had to be taken into some remote areas. Also, the veins of ore in the Pierce area were small, making it difficult to mine through the use of stamp mills. While only a few lode claims actually proved to be successfully, the Mascot and the Democrat, located in Bald Mountain country, were two that were fairly well-known. The American Mine near the mouth of the McCauly Creek was both a lode and placer claim. 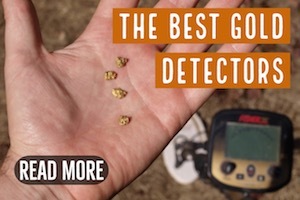 Generally speaking, Pierce was primarily a placer gold producer, and while there were many lode mines that were established over the years very few of them were profitable for any length of time. The third stage of mining in Pierce was dredging. This stage started in 1906 and ended sometime in the 1930s. Large bucket line and dragline dredges did a lot of what the placer miner did but much more efficiently. They could process huge amounts of gravel which meant large quantities of gold could be recovered. Dredges operated outside of the area’s forest boundary. Many were dredged in Rhodes Creek. The first operated closer to Pierce, the area then referred to as Canal Gulch and later Rhodes Creek, the American Mine in part of Orogrande were dredged. By the 1890’s, timber also became an industry that helped sustain Pierce well into the 20th century. As the gold started to play out the timber industry really started to thrive. Throughout the next century very little commercial gold mining took place in Pierce. A few dredging operations continued off and on, but timber was much more profitable after the initial gold rush. There is very little gold mining taking place in Pierce today, but that isn’t to say that there isn’t any gold left to find. A casual prospector could certainly still recover fine gold from the historically rich areas around Pierce.